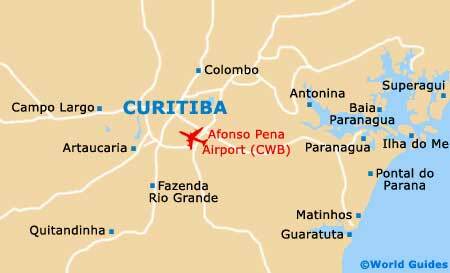 A bustling state capital, Curitiba has a good choice of hotels and some very affordable lodging. Backpackers will find that budget accommodation doesn't come much cheaper than the Curitiba Eco Hostel, which is to be found on the Rua Luiz Tramontin, on the outskirts of the city and next to the forest. Owned by Accor, the Formule 1 Centro Hotel on the Rua Mariano Torres is another reasonably priced accommodation option and highly suitable for families, being close to the Estádio Durival Britto e Silva stadium (Estádio Durival Britto). Also providing good value is the Quality Hotel on the Alameda Dom Pedro, the Tulip Inn Sao Jose Dos Pinhais on the Rua Barao Do Cerro Azul, and the Bourbon Curitiba Hotel and Tower on the Rua Candido Lopes, the latter of which resides in the heart of the business centre. Familiar lodging brands remain an important part of the accommodation available in Curitiba, with well-known names such as the Crowne Plaza (Rua Presidente Carlos Cavalcan), the Mercure (Rua Emiliano Perneta), and the Radisson (Avenida Sete de Setembro). Close to the Radisson and near to the popular Lupulus Night Club is the Four Points by Sheraton Hotel, which comes highly recommended and features an extensive breakfast buffet each morning. If you are prepared to spend just a little more, then an array of luxury accommodation presents itself in Curitiba. Residing within the elegant neighbourhood of Batel, the four-star Pestana Hotel is to be found on the Rua Comendador Araujo, close to the Shopping Omar complex and the Praca Rui Barbosa. Even more swanky is the Mabu Royal and Premium Hotel on the Praca Santos Andrade, where staff seem to go out of their way to make your stay a pleasant experience.